Our Fullerton apartments are located in Downtown Fullerton, a city known for education opportunities and a vibrant music scene. They are steps from bus stops on both Harbor Blvd. and Chapman Ave. and just four blocks from the Metrolink for easy commuting to Anaheim, Buena Park and other Orange County communities. 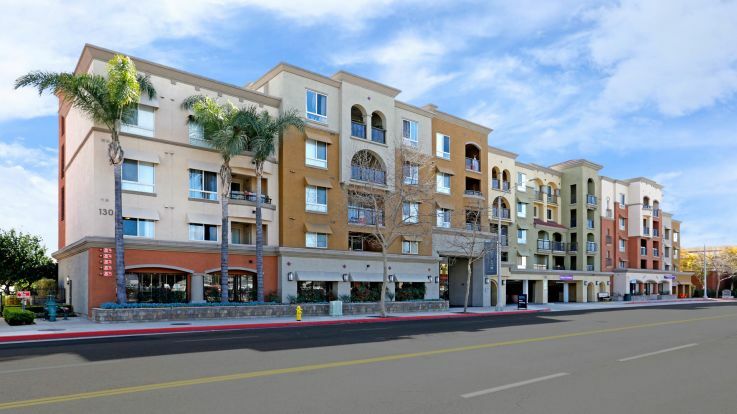 Getting around by car is easy too because of the great location our Fullerton apartments have. Fullerton apartments are great for students of California State University, Fullerton, just a few blocks to the east, as well as Fullerton College. These institutions, as well as the Fullerton Museum, provide residents with diverse cultural opportunities. Families living in our Fullerton apartments will appreciate the city's public schools, including Sunny Hills High, Fullerton Union High, Troy High, La Sierra High and La Vista High. Private schools incude Annunciation Catholic School, Saint Justin, Saint Juliana, Rosary High School, Arborland Montessori, Berkeley School and Eastside Christian School. Residents of our Fullerton apartments know that Fullerton boasts some 50 parks, a few just blocks from our luxury apartments. Dining and shopping are also close at hand at Fullerton Town Center, Our apartments are also convenient for employees of area companies like St. Jude Medical Group, Beckman Coulter, Raytheon, Alcoa Fastening Systems and Albertson's. Nearby shopping destinations include Metrocenter Fullerton Shopping Center and.East Fullerton Shopping Center. Equity's Fullerton apartments provide a carefree contemporary lifestyle with all the extras. Apartments have 9-foot ceilings, crown molding, private patios or balconies, spacious closets and storage space, in-home washer/dryer and bathrooms with garden tubs. The modern kitchens are fully-equipped and feature stainless steel appliances and hardwood floors. Our Fullerton apartments are gated communities with subterranean parking, courtesy officers and on-site management. You can also enjoy the heated outdoor swimming pool and other amenities. Our Fullerton apartments are the right choice for luxury living in Southern California. Be sure to also check out our beautiful properties in Huntington Beach and Foothill Ranch.